The right landscape lighting choices can give your property a whole new look. Outdoor lighting can improve your yard’s safety, lend beauty, and extend the use of your outdoor spaces. It can also draw attention to gorgeous plants and focal points like stonework and water. 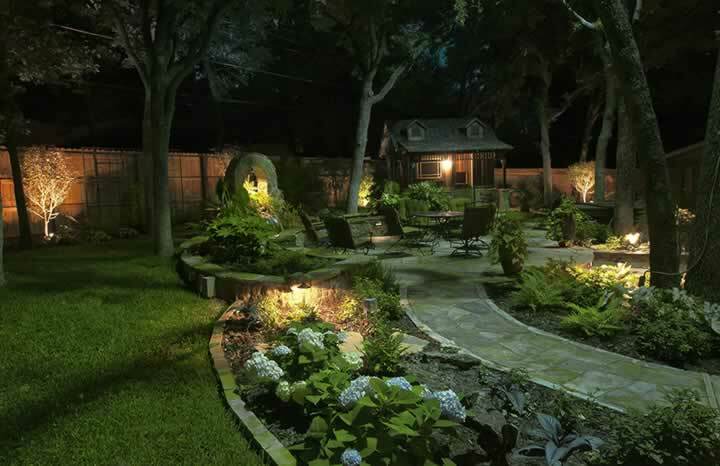 Here are some tips on how to best use lighting to highlight features of your landscaping. Many properties have one or two focal trees as part of their landscaping. You can wind strings of tiny fairy lights along the branches for a cheerful, twinkly effect. If you want to go bolder, use directional or spot uplights at the base of the tree to show off its size and majesty and reflect off of the leaves. This can be a spectacular option for spring-blooming trees or ones with fall foliage. You can also attach tree mount lights to the trunk and branches, which let you highlight ground level garden features like flower beds or the patio. Above-surface lights reflect off the water, casting rippling patterns of light on the surrounding landscape. Underwater lights create a softer, magical glow. They are particularly effective in places like swimming pools, koi ponds, or other larger bodies of water. Recessed lights can be mounted below a moving water feature such as a waterfall or fountain, creating a visual effect that is a blend of the other two. In-ground light fixtures that let you shine a small, precision spotlight on a feature. Hardscape lights, which are mounted on existing landscaping features such as stone walls. Lights installed at several levels to highlight both high and low features. Colored lights which establish different moods in different areas of the yard. LED lights can be set up to cycle colors or switch between tinted and regular white light. These shade-casting structures are particularly popular in warmer climates since they let the household enjoy the great outdoors without getting cooked by the sun. At night, they can also transform into an amazing feature of your property. Use lamps to outline or define the gazebo or pergola’s shape and provide pleasant ambient overhead lighting. Another option is to use rope lighting. These fiberoptic strings are energy-efficient and put out little heat, making them a great option for lighting wooden structures. The right landscape lighting can make your property appealing and let you enjoy it fully, day or night. Landscape By Design has twenty years of experience making properties shine at night in Fort Worth and surrounding areas. Our experienced crew will work with your unique property and individual budget to design a landscape that’s perfect for you. Visit our website or call us for a free consultation.